Help My House is Falling Down.. Not! When Sarah Beeny encountered a bulging wall in Series 1 of the popular TV series Help My House Is Falling Down, Channel 4 researchers turned to Twistfix to source the latest in wall restraint technology to tie the outside wall to the structure through a number of joists running parralel to the wall. In the first episode of Series 2 Sarah encountered a slightly more complex problem when she came across a similar structural bowing defect in a house in Leices­ter­shire, though this time with the joists runing perpendicular to the wall. Once again Twistfix provided a low-cost and easy-to-use practical solution in its versitile and patented replacement wall tie. A small pilot hole was drilled through the brick wall in line with the joist ends. Using the unique SDS setting tool the highly engineered helical tie was driven through the brickwork and deeply into the joists ends at amazing speed, locking the wall solidly in place. A defect that could have cost more than £2000 to rectify was carried out for "... less than a hundred quid ..." and the gable wall was completely secured. Other products used in this episode was the Rubber Roofing materials, utilsed as a new covering to stop the leak in the roof and the Damp Mould Removal Kit, which was used to remove mould on the damp walls, kill mould spores and protect against further fungal growth. 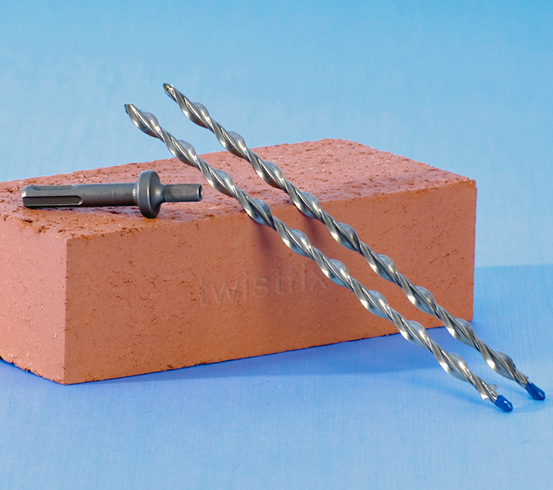 Twistfix is the UK's largest on-line supplier of specialist products for construction and refub­ris­hment, offering materials such as damp proofing systems, remedial wall ties, rubber roofing, mould removal and basement waterproofing membranes to industry specialists, general builders and competent DIY enthusiasts.